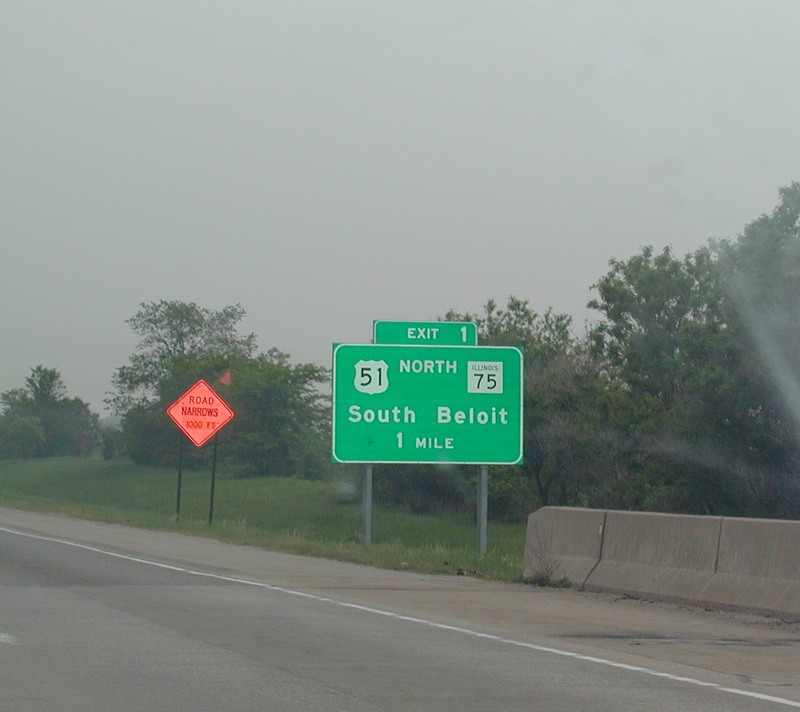 NB IL 59 at the junction shield for US 20. 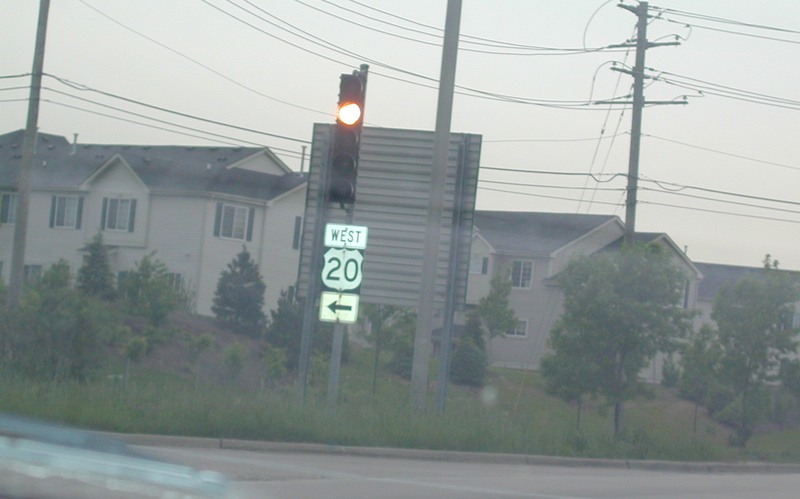 In the Chicago area, US 20 is known as Lake Street. 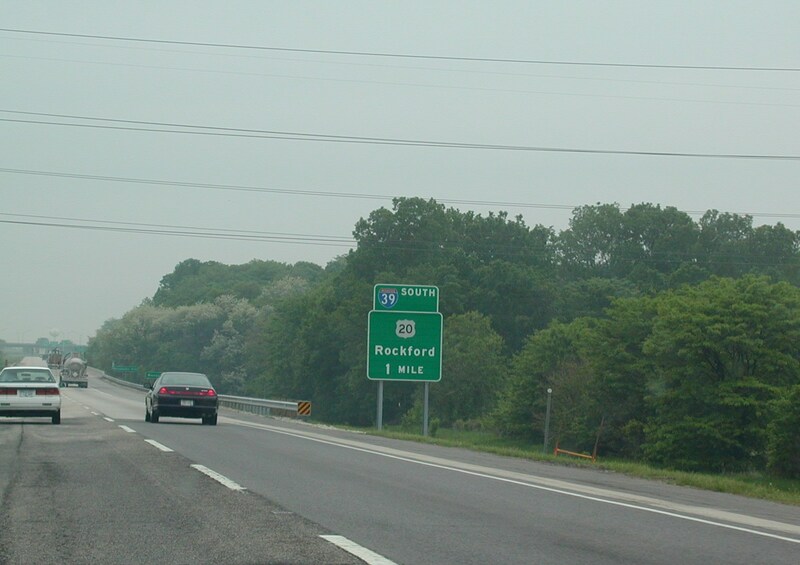 US 20 is not really a freeway, and neither is Route 59, but there is an interchange between the two roadways. This is at the ramp to West US 20. 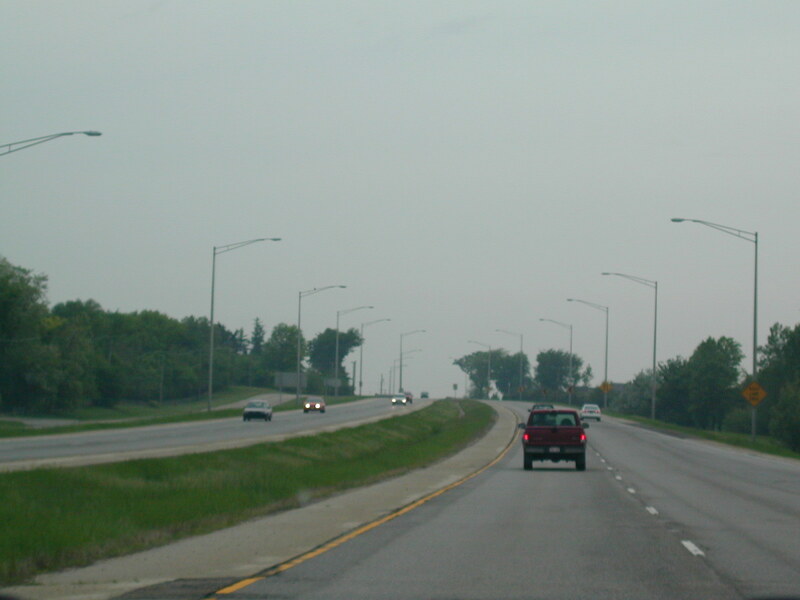 However, in Elgin, US 20 turns into a freeway that bypasses the main part of the city. There used to be a Bus. 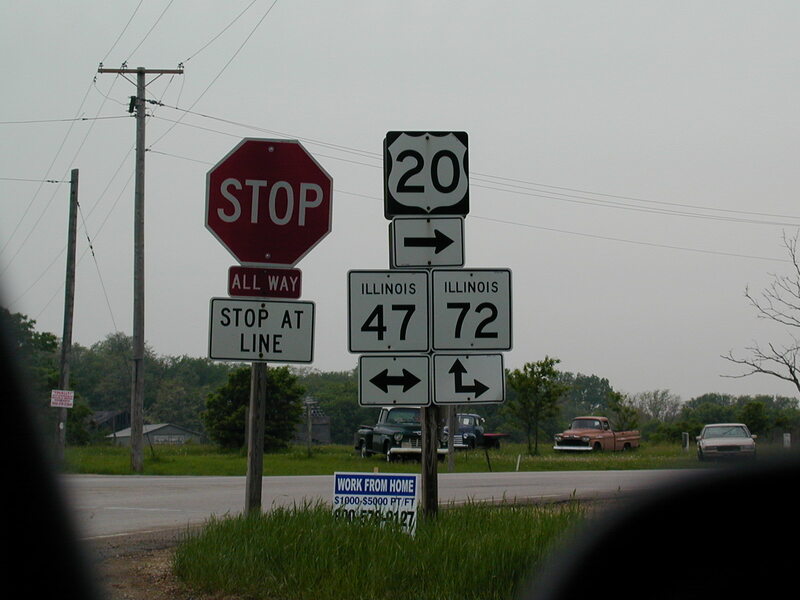 US 20 through Elgin, but that doesn't exist anymore. 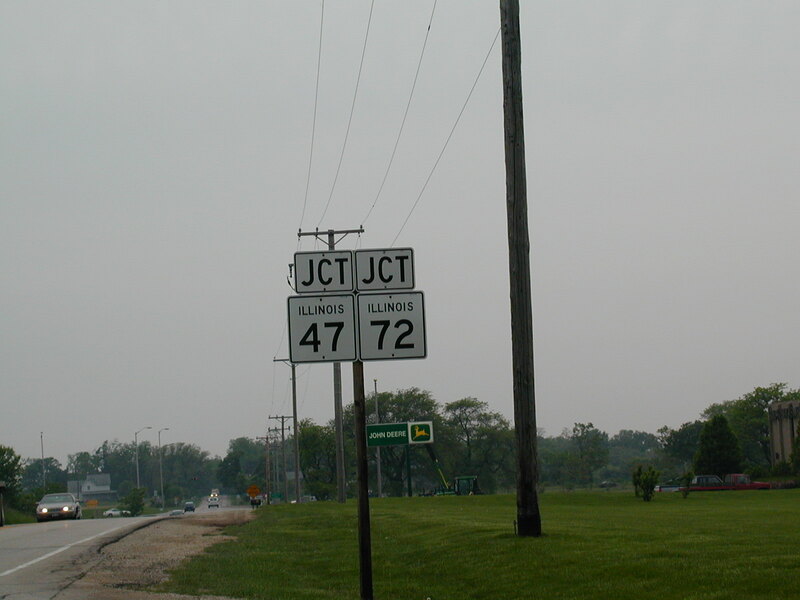 The freeway is short-lived, and west of Elgin, US 20 meets IL 47 and IL 72 in Starks. 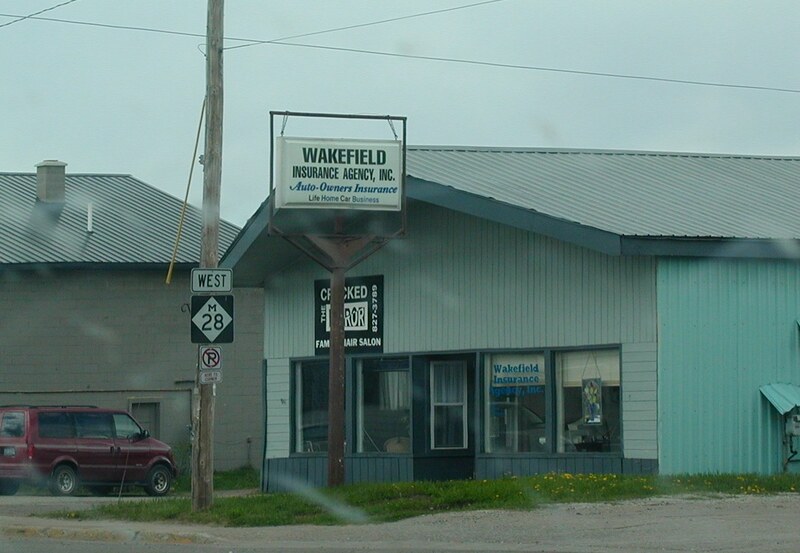 At the intersection of the three roads in Starks. The three roads share four lanes for about 1/2 mile before splitting up again. 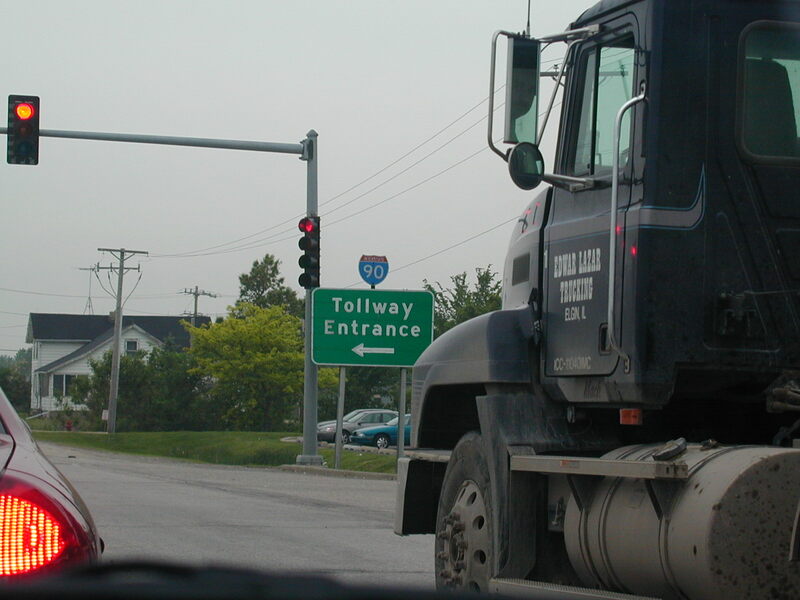 Notice how the I-90 shield was just added on to the "Tollway Entrance" green sign. 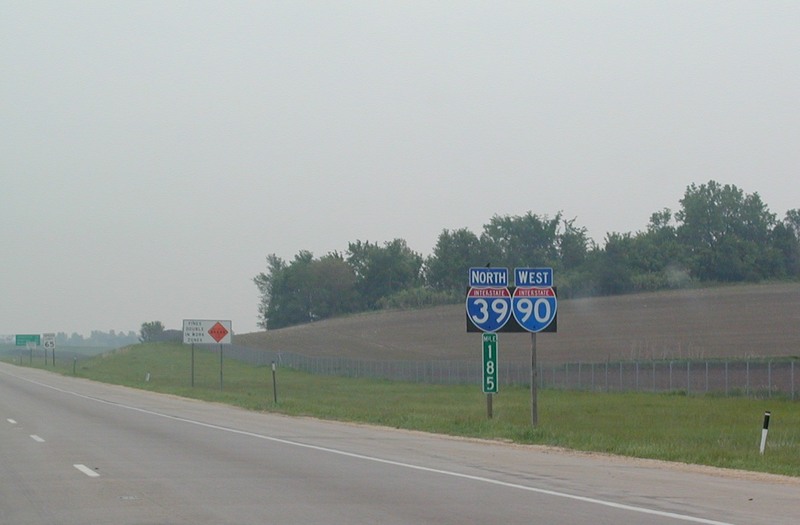 The I-39 part of this sign was also added on. 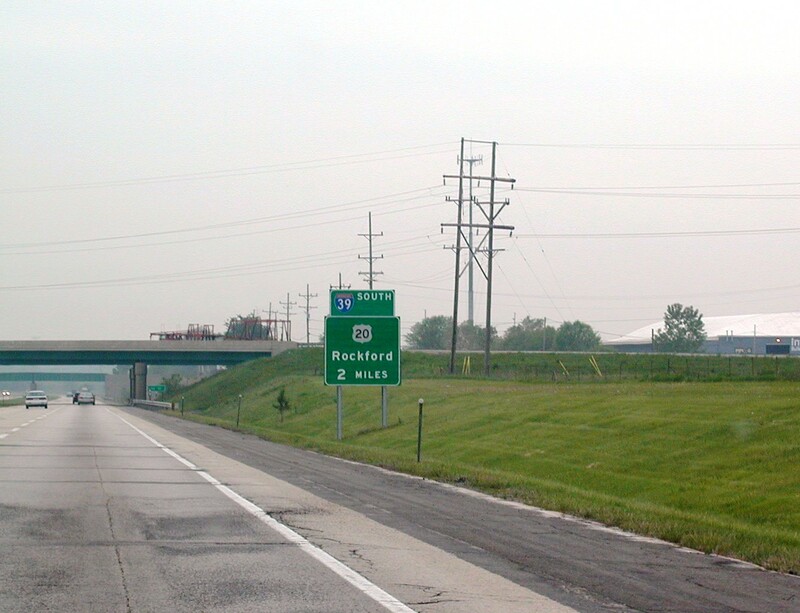 I-39 briefly follows US 20 around to I-90 south of Rockford, and the US 20 sign predates the interstate. 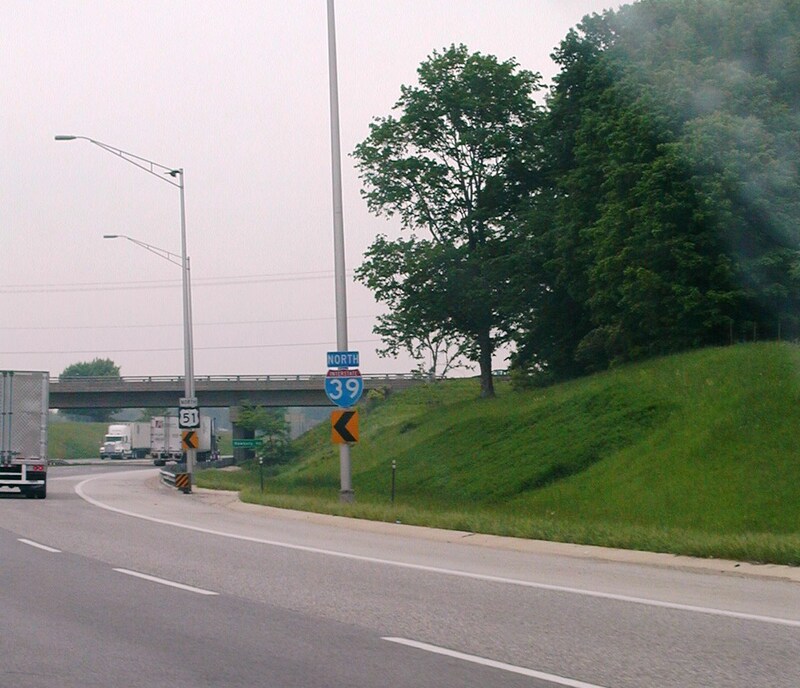 So they just tacked on an I-39 little green sign on top. 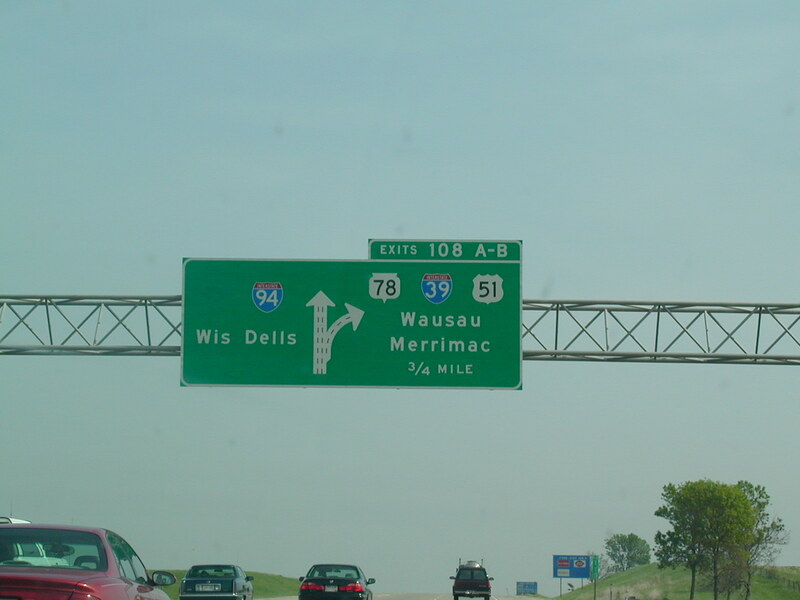 Getting closer to I-39. Why no mention of US 51? 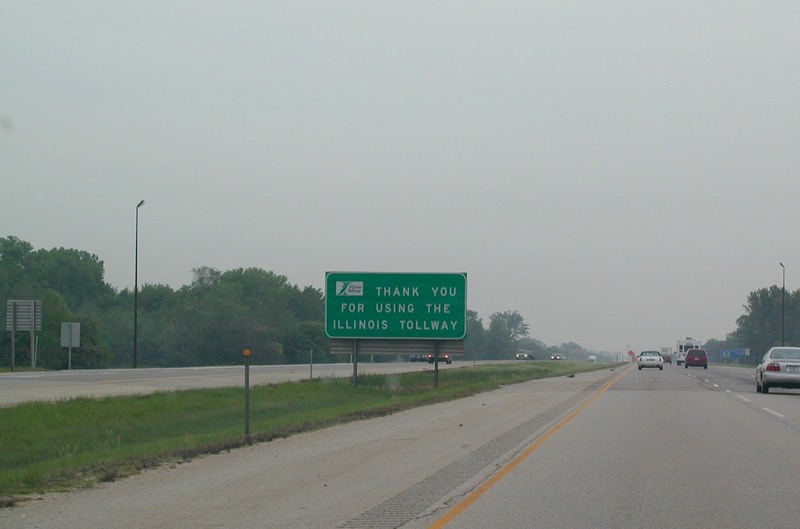 I-39 officially joins the Northwest Tollway. 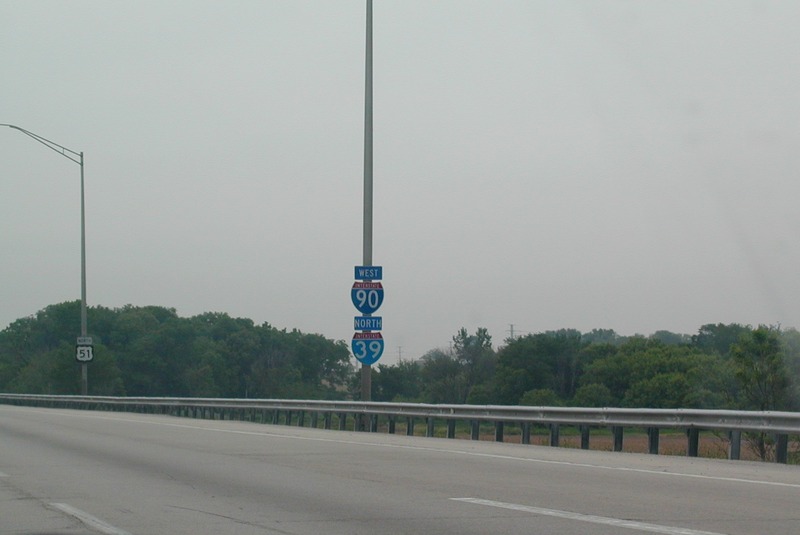 I-90 is on top, as it is the dominant road. 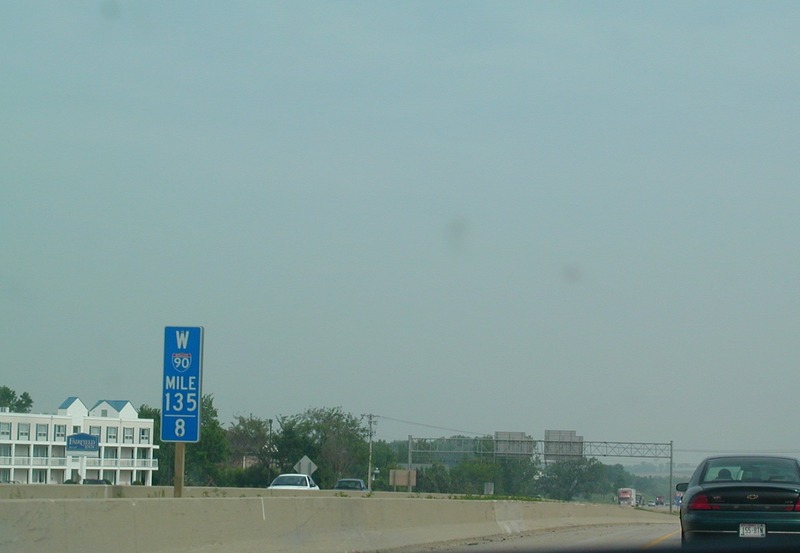 The northern end of the Northwest Tollway. 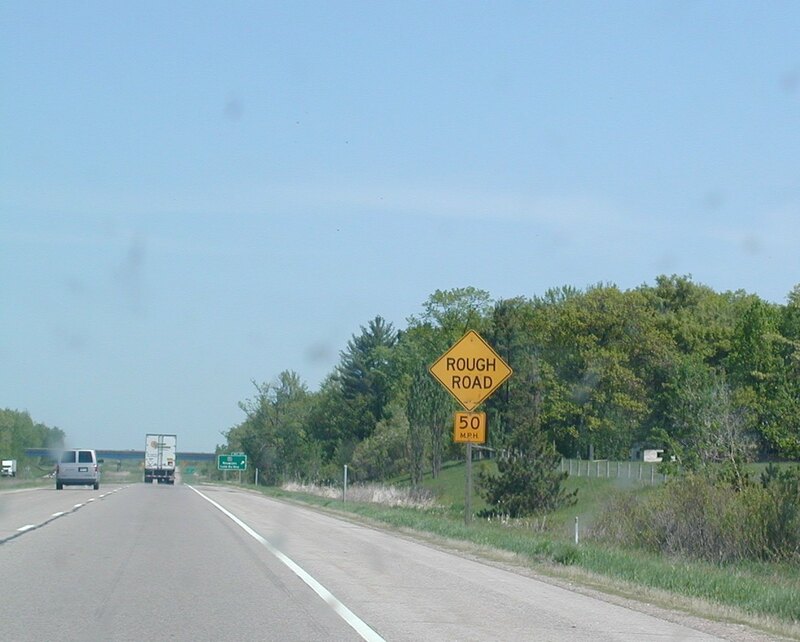 IDOT will take over for a mile or two before the interstates enter Wisconsin. 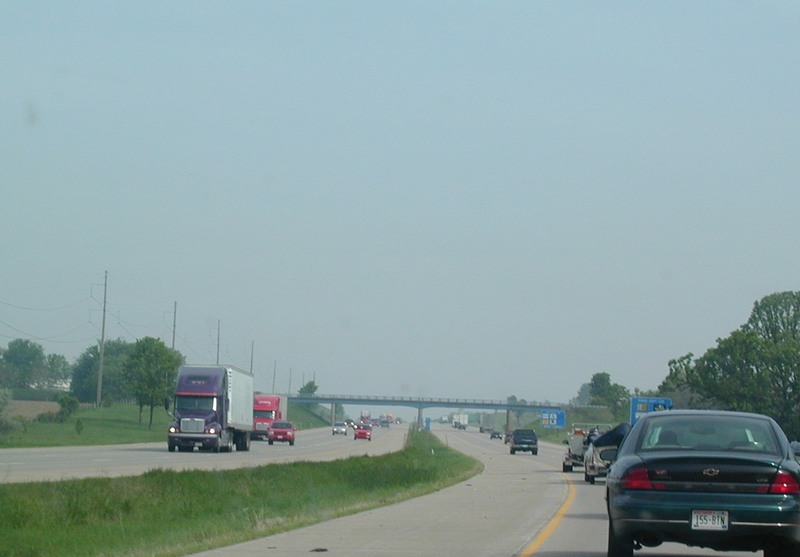 US 51 will leave the roadway in one mile, heading north to parallel I-39/90. 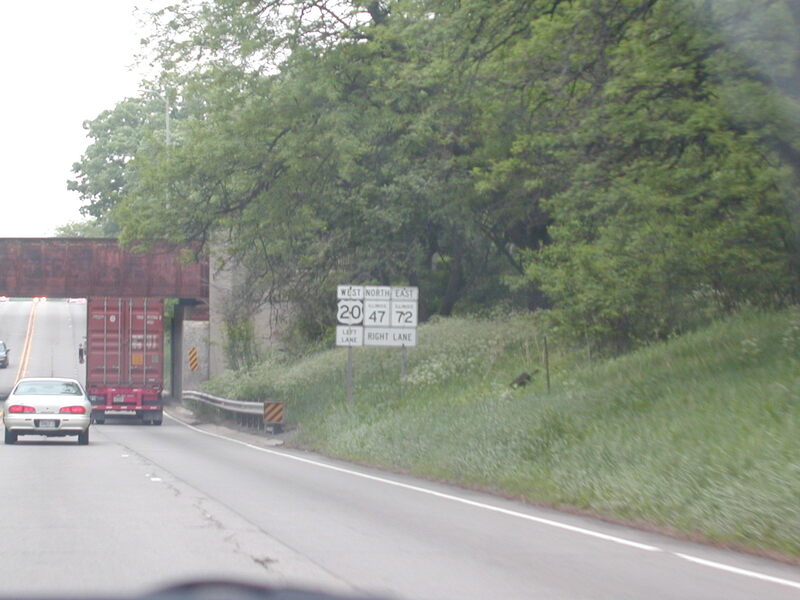 IL 75 heads west and IL 251 meets those two roads and goes south into Rockford. Still in Illinois, but just barely. Wisconsin is in less than a mile. 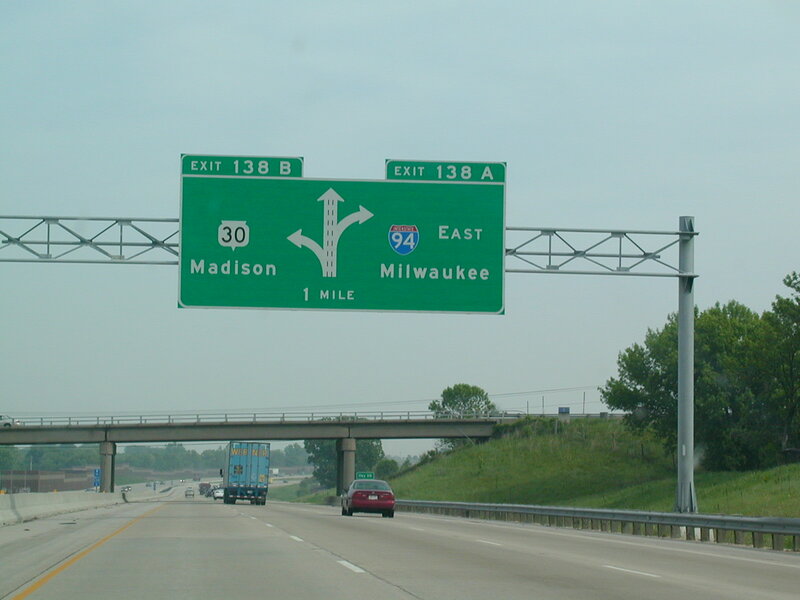 The first exit in Wisconsin on I-39/90 NB is for I-43, which sees its southern terminus here. 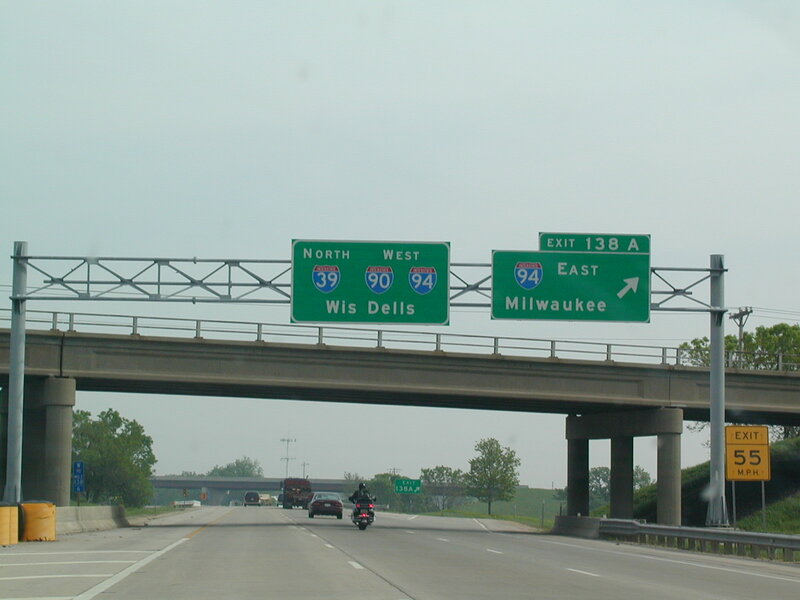 I-43 goes to Milwaukee before ending in Green Bay. 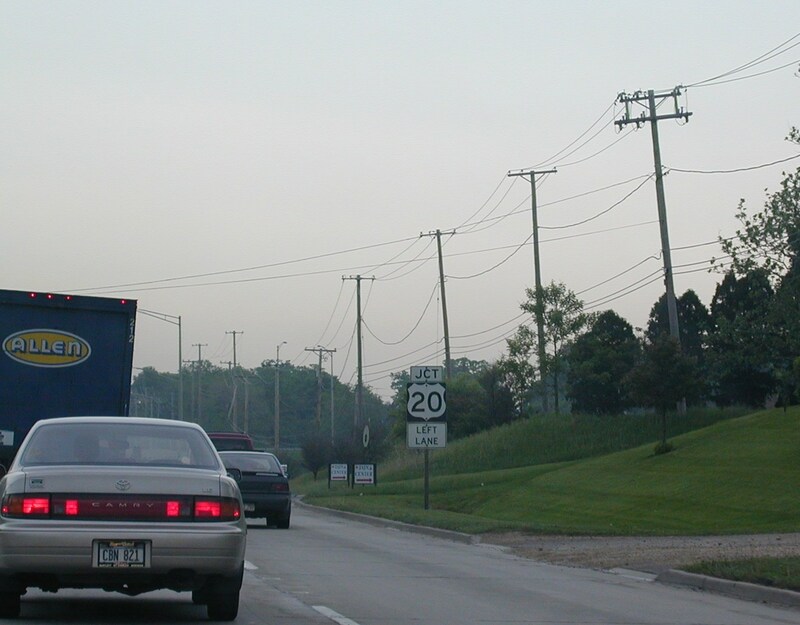 Wisconsin often uses these black backplates on its interstate shields. 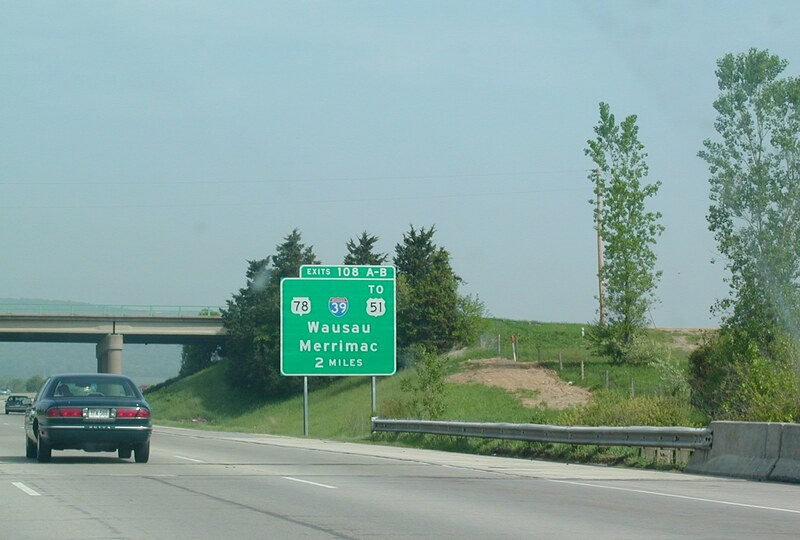 Closing in on Madison, at US 12 and US 18, which form a belt around Wisonsin's capitol city. 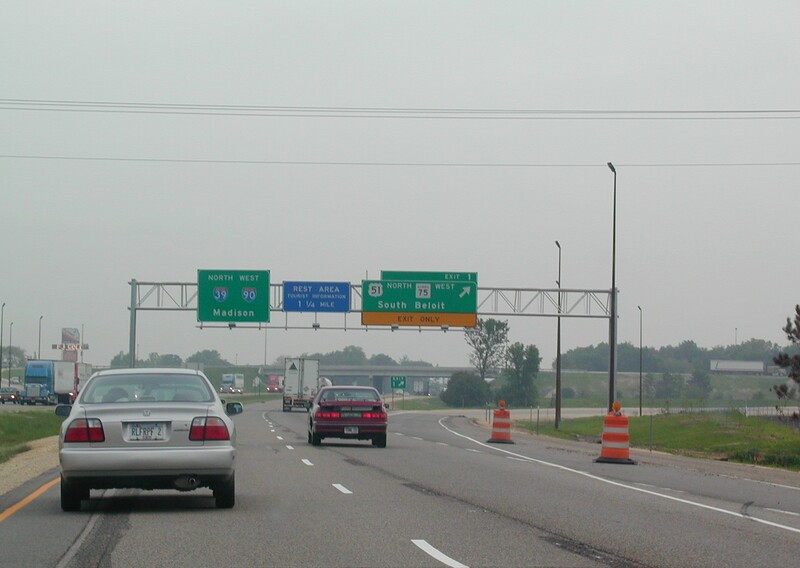 I-94 is about to join I-39/90, forming the longest 3-way multiplex in the nation, out of 2. 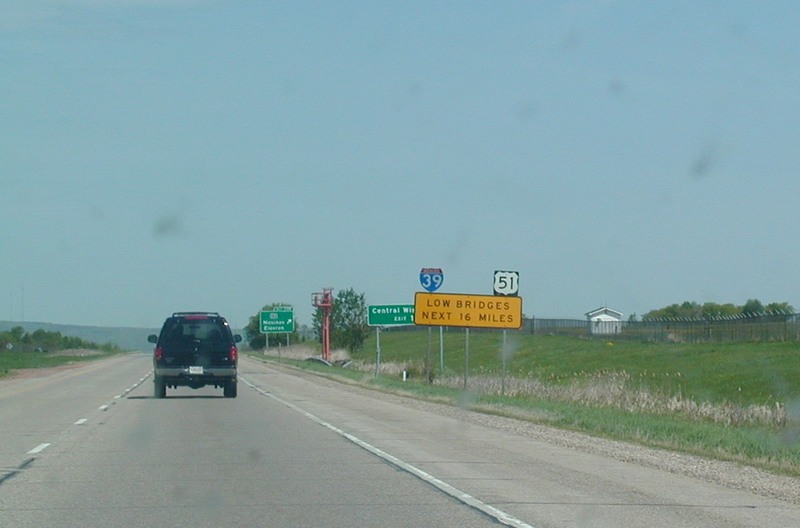 The miles are marked for I-90 only. The median is narrow in these parts. 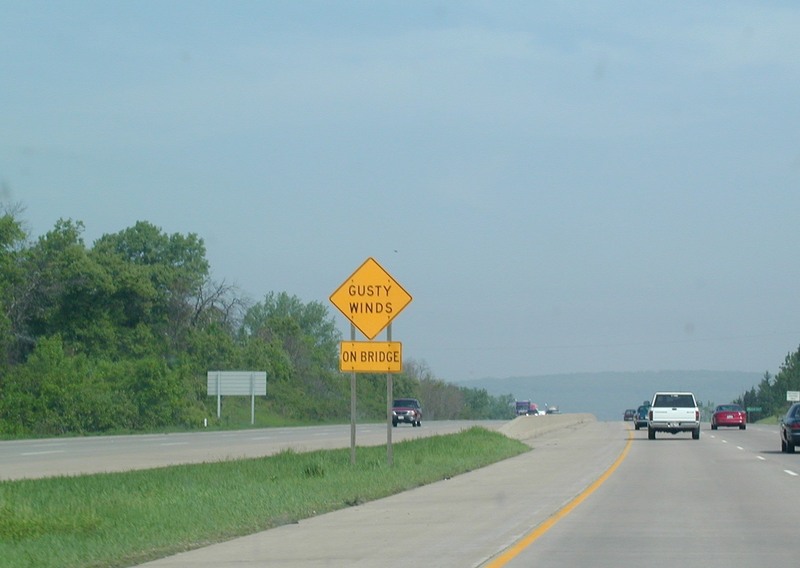 A diamond-shaped sign on the interstate advising motorists of gusty winds on the upcoming bridge. 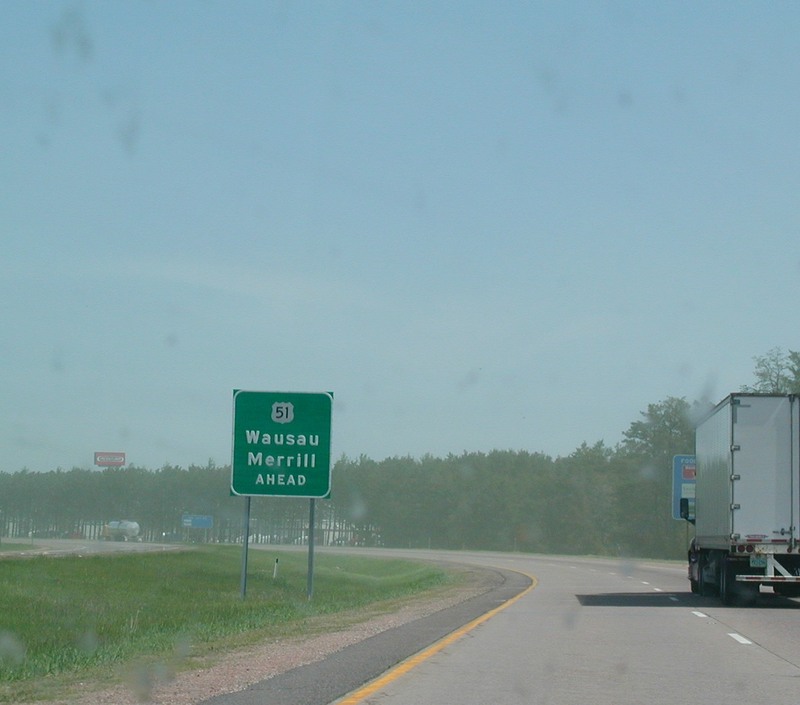 I-39 prepares to leave the roadway up to Wausau, where it will end. 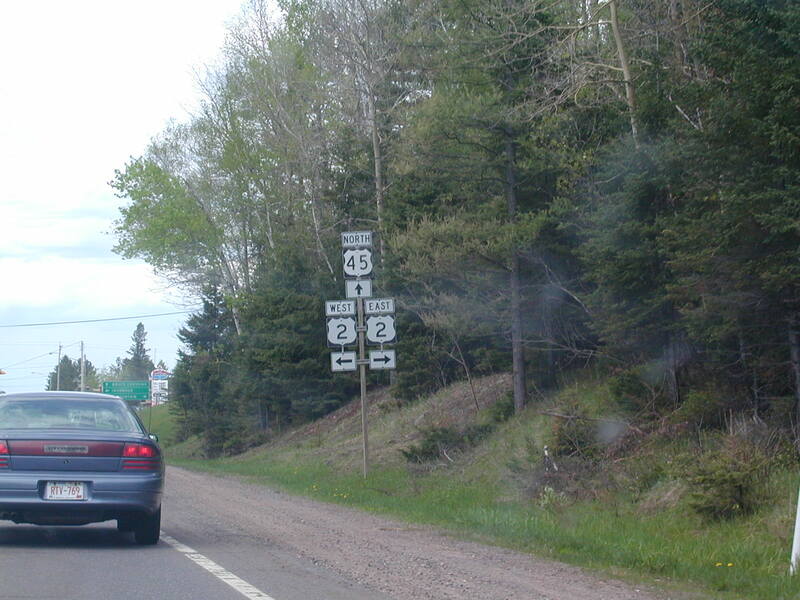 The I-90 shield must have fallen off because there is only I-94 left. 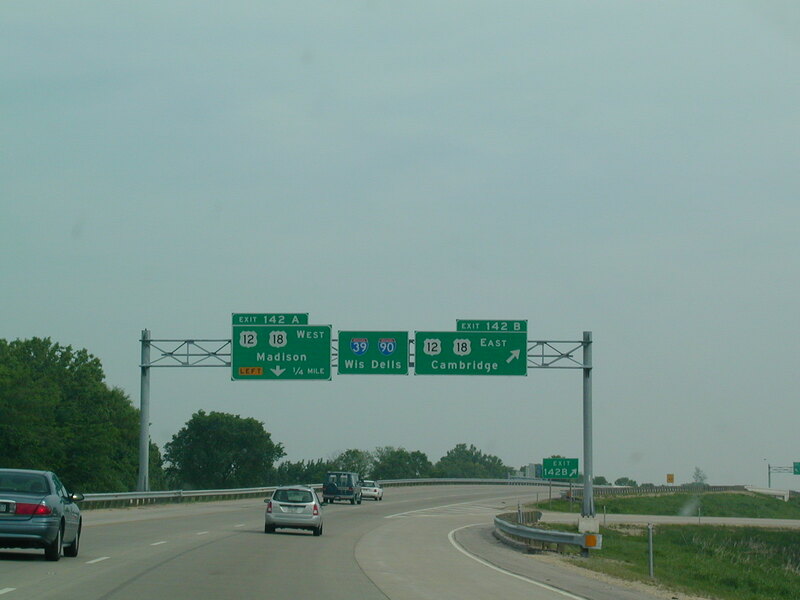 I-39, "To" US 51. 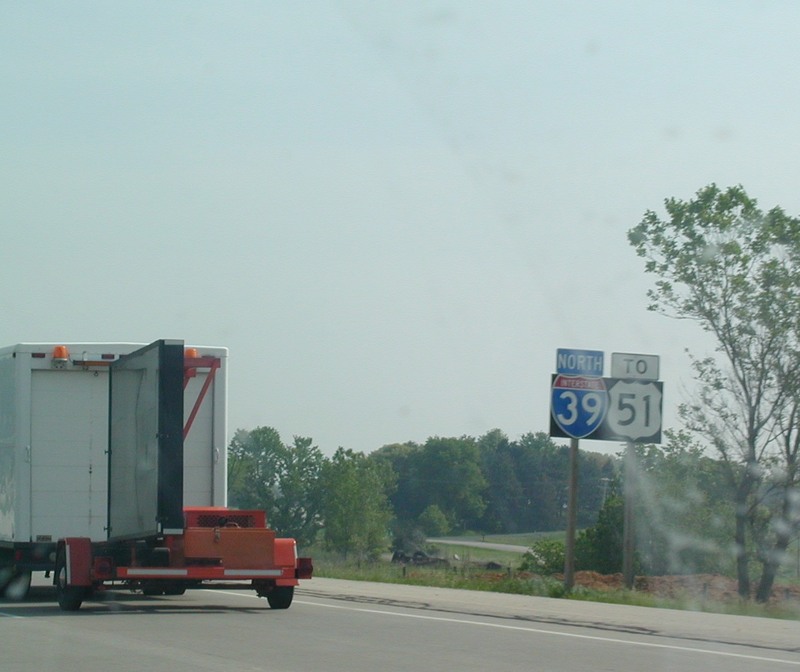 I-39 had a detour for CR J at the time. 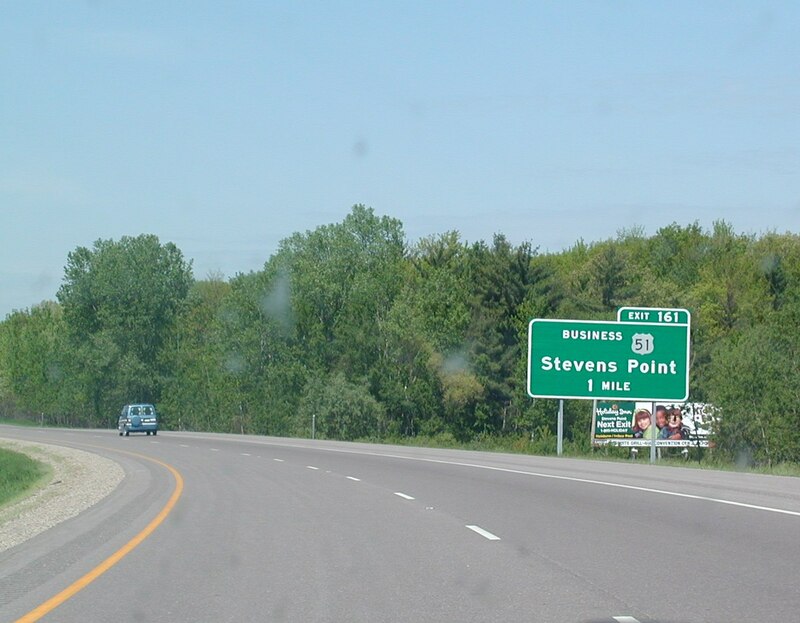 I-39 NB near Stevens Point. 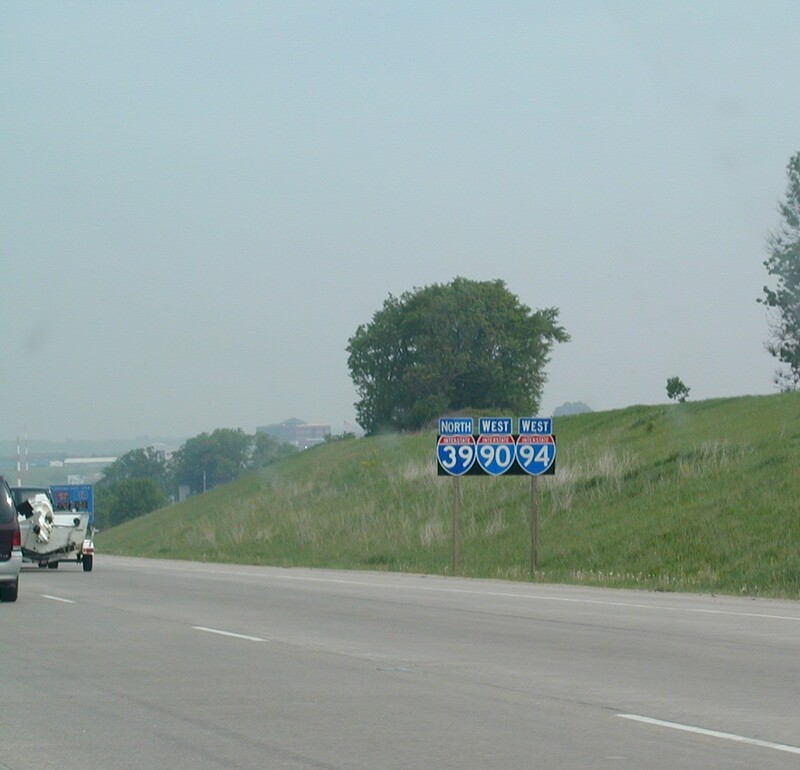 Wisconsin has weird-looking speed limit signs on some of its interstates. Rough road on the interstates. 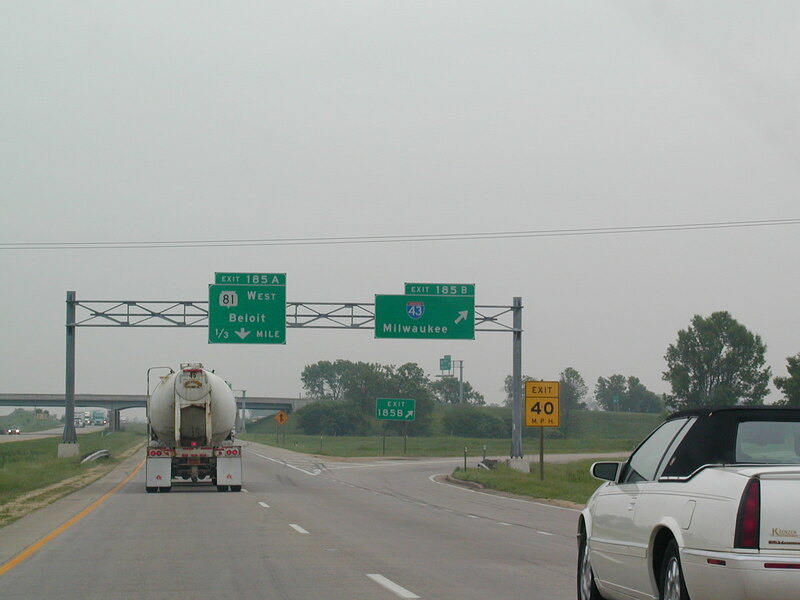 Low bridges ahead on I-39 US 51. 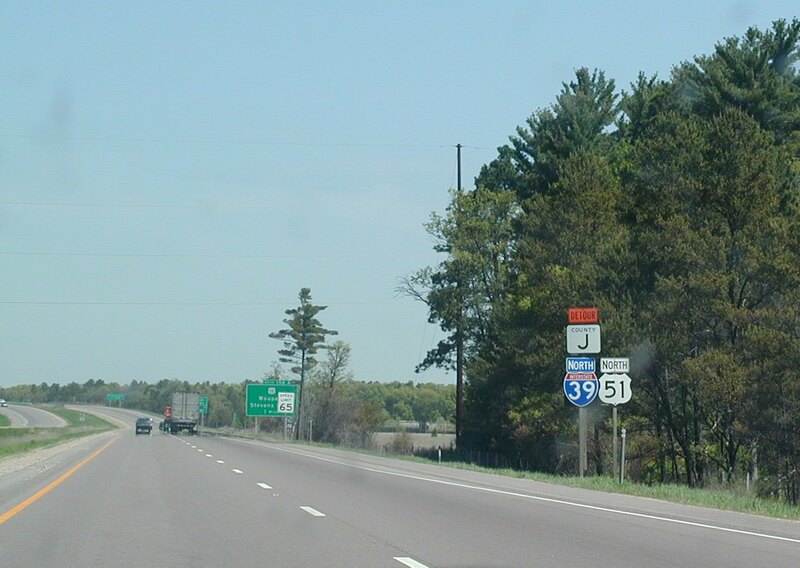 US 51 is about to take over the roadway as I-39 ends soon. 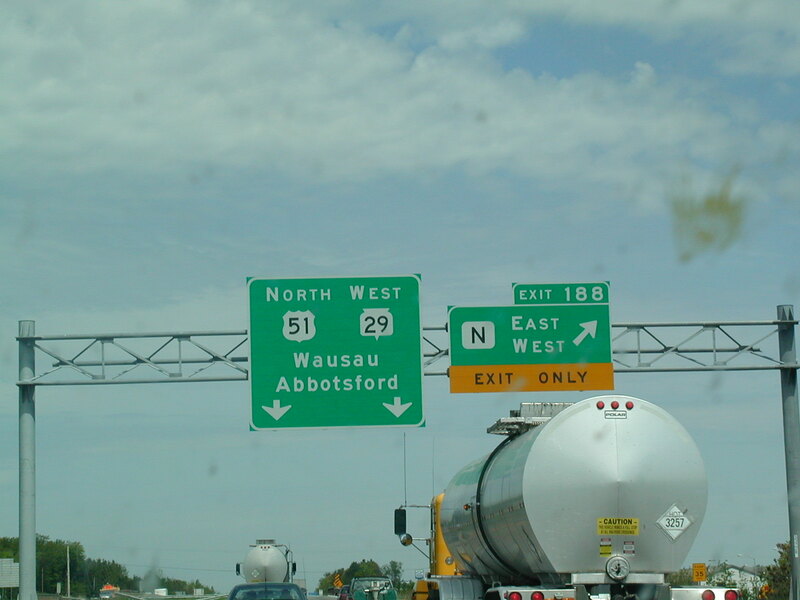 US 51 and WI 29 continue, I-39 is dead in Wausau. 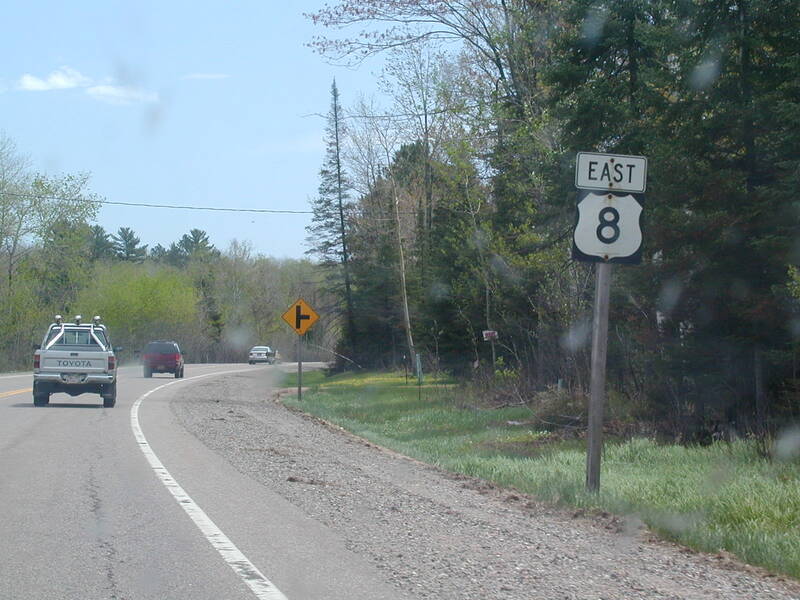 East US 8 west of Rhinelander. 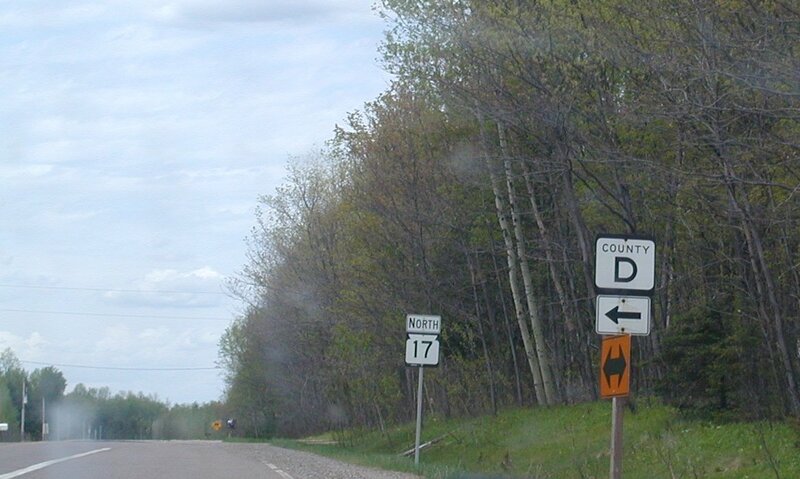 WI 17 NB north of Rhinelander. 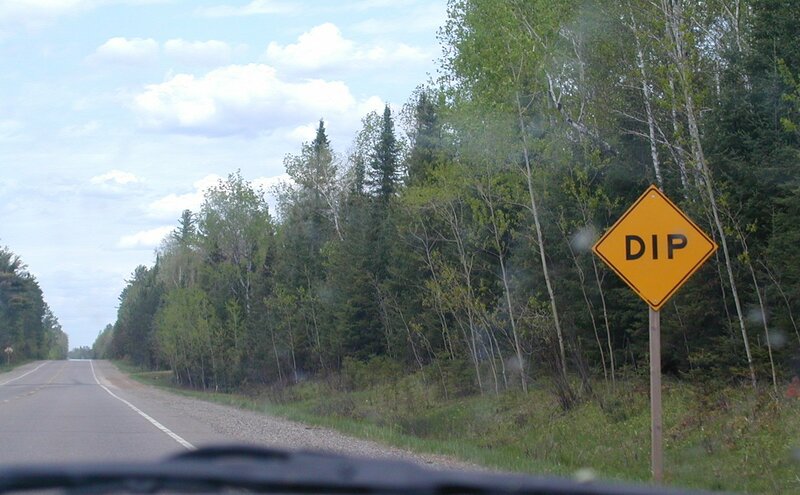 This sign must want to pick a fight. 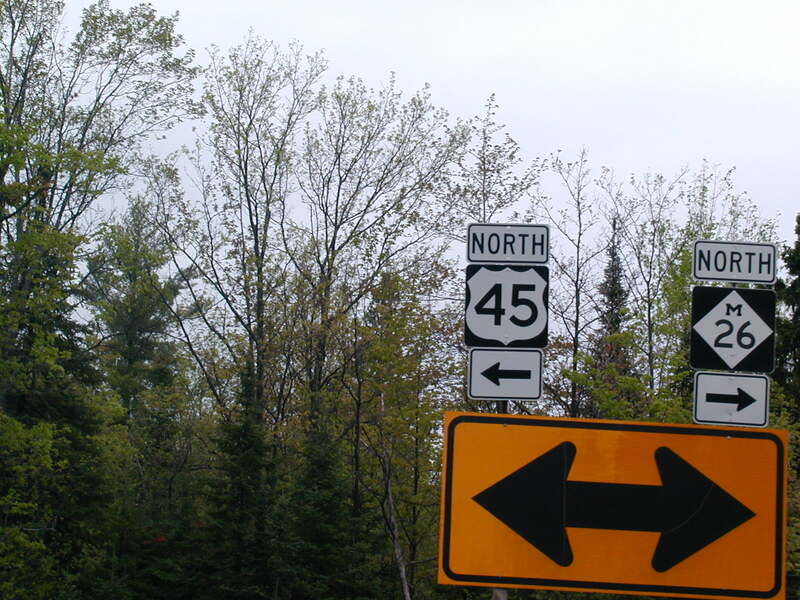 In Eagle River, we pick up US 45. 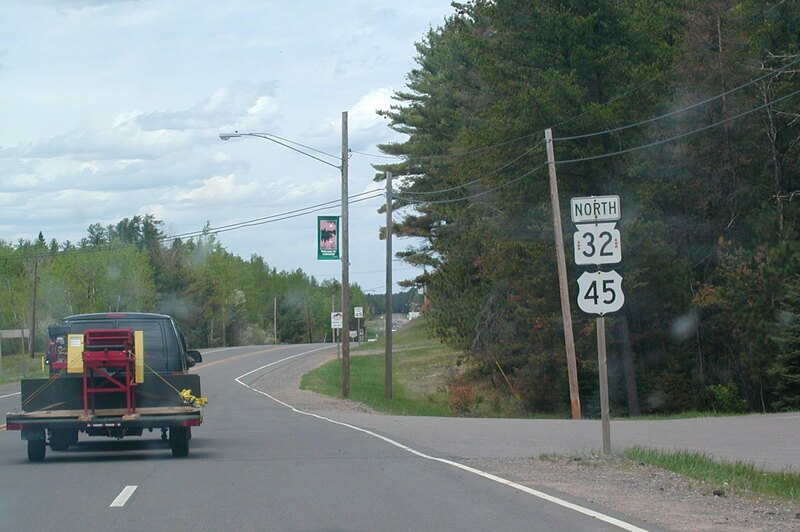 US 45 and WI 32, which I think is called the Red Arrow Highway, and explains the red arrows inside the shield. 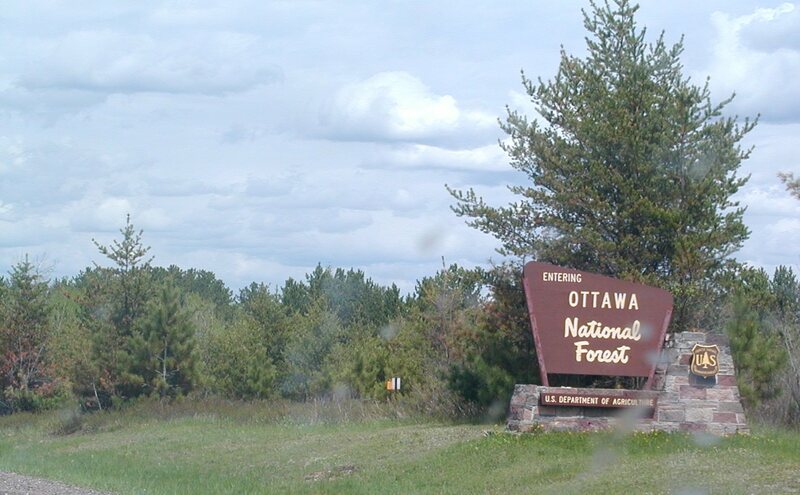 Ottawa National Forest. 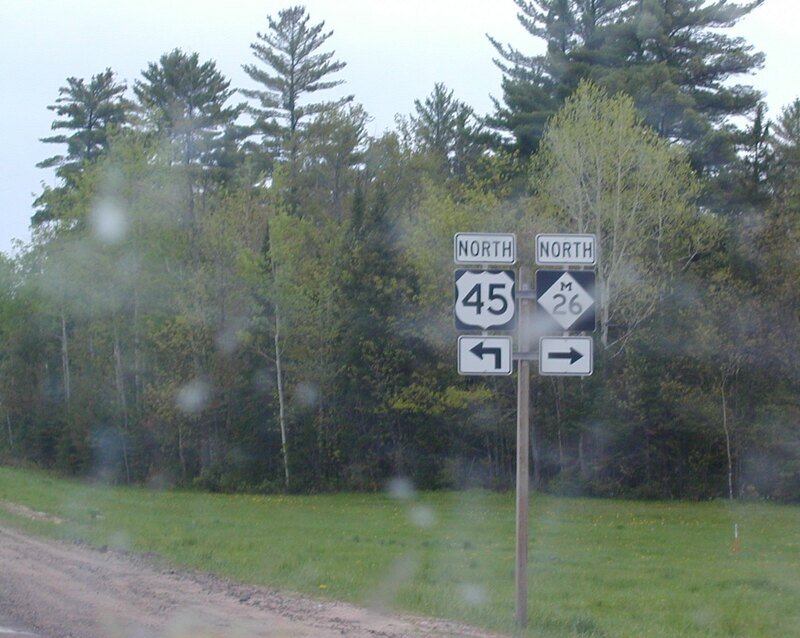 US 45 North in Michigan now. 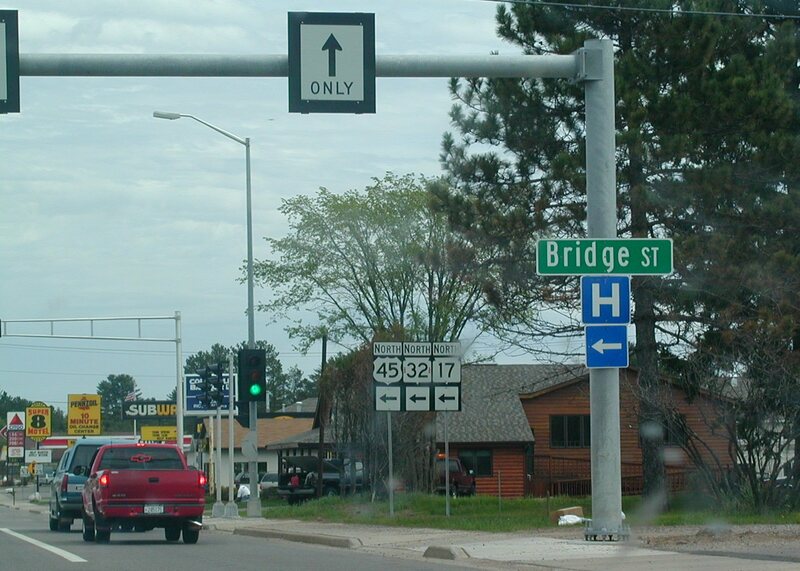 US 45 crosses US 2 in Watersmeet. M 28 Bruce Crossing. M 26 south of Rockland. 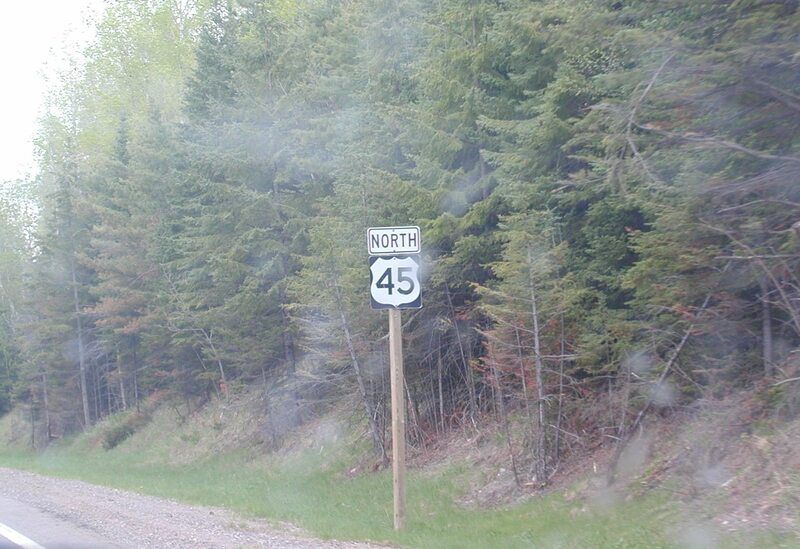 North US 45 turns left to Ontonogan.